LATEST ISSUE – OUT NOW! Our latest issue celebrates how vintage technology connected people together, with articles on The Print Shop, modems, bulletin-board systems (BBSes) and online services. 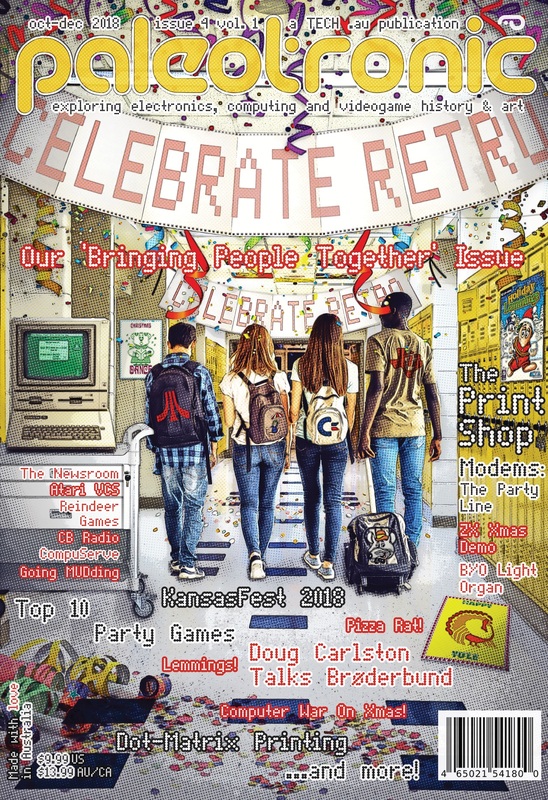 There’s also articles on modern-day retro events such as Kansasfest, CommVEx, the Adelaide Retro Computing group and Square Sounds, and an interview with Broderbund founder Doug Carlston about his family’s business. Confessions of a Disk Cracker: the secrets of 4am. Play Apple II games in 3D on Windows, macOS and Linux with our microM8 8-bit computer emulator! ©2018 Paleotronic Magazine, a project of Teaching Electronics and Computing History (TECH) Inc., an Australian not-for-profit organisation.